The Australian trio Roam the Hello Clouds works a laptop into the mix. Lawrence Pike on drums and Phil Slater on trumpet collaborate with their third member, Dave Miller, who is billed with laptop, and whose primary sound sources are the live performances by Pike and Slater, which he augments in real time. The scenario recalls the role of Brian Eno during the early stages of Roxy Music, when he was, among other things, emphasizing the use of the mixing board itself as a part of the creative process. The result, as evidence by a lengthy performance posted courtesy of the Australian Broadcasting Corporation National Radio show Sound Quality (abc.net.au), brings to mind everything from late-1960s Miles Davis to the more recent digitally augmented work of Nils Petter MolvÃ¦r, to the efforts of an earlier jazz-tronic trio, Miniature, which featured saxophonist Tim Berne, drummer Joey Baron, and advanced-technique cellist Hank Roberts. Part of what makes Miller’s light touches work so well is that he is matched by the genteel but dedicated efforts of his partners in electro-acoustic crime. Neither Pike nor Slater are show-offs. Pike is more than happy to, when time for a solo comes, focus on small clicks and the occasional tap on a drum pedal — which Miller then refracts through effects that suggest the rhythms of a distant helicopter. As for trumpeter Slater, he is as comfortable with scratchy embouchure gestures as he is with warm, lush, held tones, and Miller knows exactly how to work with him, tossing tiny sine waves into the former and lending dubby echoes to the latter. We’re blessed these days with adventurous trios, from Medeski Martin & Wood to Dirty Three. Run the Hello Clouds is fully in their league. More on Miller at thebodyraft.com, on Pike at myspace.com/laurenzpike, Slater at philslater.com, and Roam the Hello Clouds at roamthehelloclouds.com and the group’s myspace page, myspace.com/roamthehelloclouds. 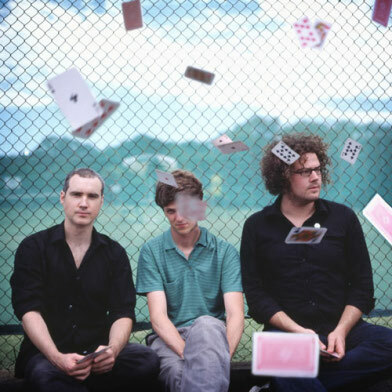 Above image courtesy of the Sound Quality website — that’s Pike on the right, Slater on the left and Miller in between.